Not only I was happy that it took her only once to watch the video and wanting to try the recipe out, but also I was encouraged to upload my video and not to be nervous anymore about it. If you love Halawa (Halva) you will love these cookies. They are both crisp and chewy and totally easy to make. The combination of Tahini and honey tastes like Halawa and who wants to resist this flavor. These cookies will be your new favorite! In a stand mixer, beat butter and sugar on medium-high until light and fluffy. Gradually add the tahini, honey and orange blossom water. In a medium size bowl, whisk flour, baking soda and salt together. Reduce the mixer speed to low and slowly add the flour to tahini mixture, combining well until forming a dough. Chill in the refrigerator for about an hour. Line baking sheets with parchment paper. Using your hands, take a walnut size of dough and shape into balls. Arrange them on the cookie sheet at least 2 inches / 5cm apart. Dip the tines of a fork in flour and gently press a crisscross pattern into each ball. Dip fork in flour after every cookie to avoid sticking. Bake in the middle rack of the oven for 13-15 minutes or until the cookies begin to show cracks. Well my menu and especially the salad, turned out to be a hit as people kept on coming back for more. I thought the best is to serve something cold like salad and cake, as it’s going to be a lot of people coming at the same time for tasting after the dancing show. There were 1200 visitors and maybe 12 stalls. 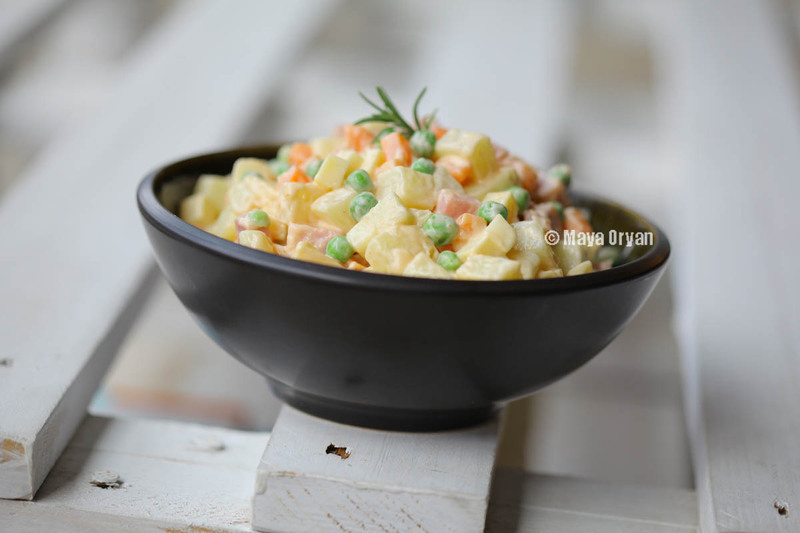 Salatka Jarzynowa is a traditional Polish salad that is served during holidays. It is prepared with root vegetables like carrot, potatoes and celery root. This salad is best prepared one day before as it needs to mature and tastes really better the next day. This was really convenient as part of the savory menu. The best version to make it is my dad’s recipe; I did mention that my dad was a chef and I sure learnt from him a lot of cooking. His recipe has always been a star dish! It’s so consistent that we can eat this alone. I remember how he decorates it with shrimps or cold cuts, and always place it side by side with the turkey on Christmas. This year’s dinner was at my sister, and dad showed up with THE SALAD and they were both more than welcome. Emile’s 2 important tips are: to prepare the vegetable salad with only vegetables that are not juicy, and to never skip the honey in the dressing. I hate when one’s look at this salad and tells me I don’t eat potato salad, am like it’s okay to venture once, it’s not only potato … my genius dad taught me how to add Emmenthal cheese, ham and apple and this is the tastier salad you can ever eat! My last request, please don’t open cans and throw in this salad, it only tastes better when you make it with fresh ingredients. How long does it take to chop little vegetables and let it boil for 10 minutes. I really hope you enjoy this recipe and consider making it during holiday celebrations. As I said, it is best to prepare one day before serving. For a fancier look, store it in a round container in the fridge, and just before serving, turn it upside down on a flat round plate and decorate with salami, cheese, salmon or shrimps. To cook the potatoes, boil water and cook potatoes 7-10 minutes until cooked but still hard. Cook carrots and peas same as potatoes, and each one separately. Please don’t cook all together in same pot because the time of boiling varies for each one. Combine cheese, apples and pickles. Add to potatoes, carrots and peas. Mix all the ingredients of the dressing and toss in the salad. Combine well gently. I use a rubber spatula not to mash the vegetables. Refrigerate.